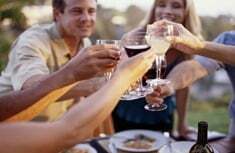 #2 Wine drinking is about as social as it gets! Sure you can drink wine alone, but where’s the fun in that? A bottle of wine begs to be shared, invites discussion, and there is nothing more satisfying than sharing a glass of vino (or 3) with the ones you choose to be close to, often over a great meal! The juice in your glass undoubtedly has a story behind it, and to be completely honest, I almost enjoy hearing the story that surrounds a wine (even the story behind the wine label), almost as much as drinking the wine itself!